So the strange gods who look after soap opera audiences have sent us the formidable Minerva Trask, who is basically Abigail Collins from 1795 but with an even more severe costume. And she knows how to press all of Rachel’s buttons, having installed most of them herself. Rachel: Mrs. Trask, this is ridiculous; I’m not going back to the school with you. Minerva: Oh, I think you are. Hmph. You are pretty. You were a pretty child, and a pretty girl. It’s been a terrible burden for you, hasn’t it? Rachel: Mrs. Trask, if you’ve come here to get me, then your trip has been wasted. Minerva: The Reverend has always said, pretty people are the Devil’s playthings! And in your case, he was certainly proved right. Oh, they’re marvelous, aren’t they? Trasks come up with that kind of stuff all the time. But Minerva has a lot more ammunition than that up her sleeve; that was just a warning shot. Rachel is a thief, she says, and a liar, and a murderer. But this girl’s too nice to do all of those things. These are obviously nothing but trumped-up charges, based on Rachel profiling. In fact, she seemed nothing but nice when she first arrived, which was kind of the problem. Rachel was introduced as this year’s Josette lookalike, with no characteristics of her own. 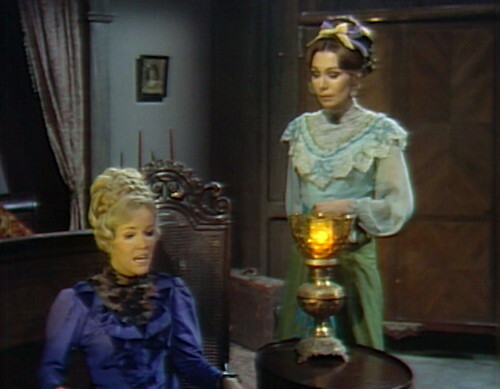 Barnabas was attracted to her because she looked like Josette, and Quentin was attracted to her because she had a pulse, and that was as far as it went. This wasn’t particularly helpful, as blank slates are typically lacking in entertainment value. But look at her now! Backstory, everywhere you look. She has a boyfriend, and she stole money, and she broke her contract, and apparently she killed a dude. Turns out she’s kind of a secret ninja. And the thing that I like most about this development is that it’s not the result of careful advance planning; it’s just a series of accidents that they managed to capitalize on. The original plan for Rachel, such as it was, definitely included the Jane Eyre material. That’s why they needed a governess in the first place, so they could have a madwoman in the attic. 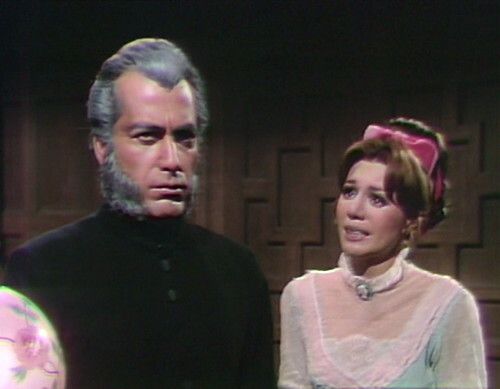 But the Nicholas Nickleby stuff only came about because Dan Curtis saw Jerry Lacy on Broadway in late February, and decided he should come back on the show. The Jenny-in-the-attic storyline has cooled off considerably in the last few weeks, so it was a good idea to give Rachel something new to do. 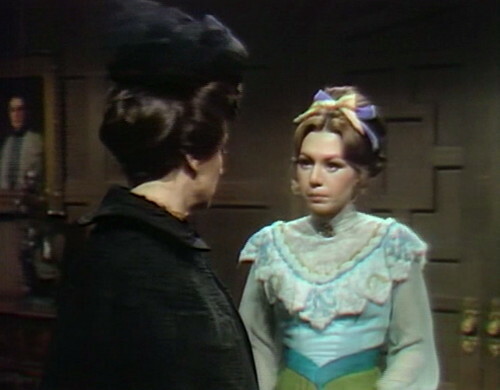 They needed her around anyway, because she’s the Josette in the Barnabas/Angelique triangle, so Reverend Trask becomes a schoolteacher, and Rachel is Nicholas Nickleby. And then Laura came along, also out of basically nowhere, and now she’s part of Rachel’s story too. Laura’s return wasn’t part of a grand plan either; she’s another opportunistic hire. And that’s how decisions get made around here. Dan offers people a job just to get out of an irritating phone call, and the writers have to figure out what to do with yet another madwoman. So another layer is added to the already complicated storyline, and once again, Rachel benefits from having more people to interact wth. This sounds like an insane way to write a story, and it absolutely is, but this is actually the correct approach for writing long-running serialized narrative. A strict plan is not a good idea, because even if you’ve got it all mapped out, you still have an executive producer who’ll offer somebody a job at a Broadway afterparty. All you can do is keep a stack of paperbacks handy, to steal a plot point if there’s a deadline looming and nothing comes to mind. P.S. There is always a deadline looming. So Rachel came in as a blank slate, and five weeks later, she’s got a rich interior life and several outstanding warrants, by way of Dickens, Brontë and The Mummy’s Tomb. I guess pretty people really are the Devil’s playthings, at least on this show. Tomorrow: The Tragedy of Tim. When Quentin is rummaging through Laura’s room, Laura is seen at the edge of the frame before she’s supposed to have appeared there magically. Quentin even glances in her direction, then keeps rummaging. The clock in Laura’s room is stuck at 7:20, from act 1 all the way through the closing credits. When Minerva and Laura are talking in the foyer, Judith stands behind them on the balcony, waiting for her cue to pretend to be panicked. At the beginning of Rachel and Magda’s scene at the mausoleum gate, the camera zooms in on Rachel’s brooch before they’ve mentioned it. 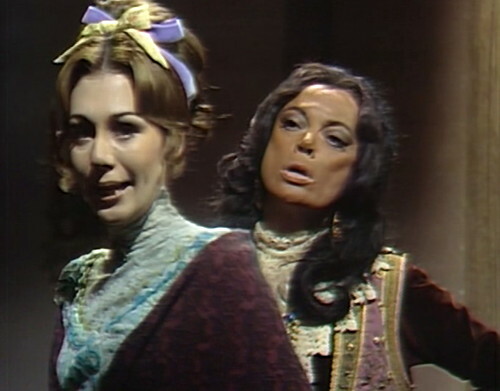 The book that I referred to above is Barnabas & Company: The Cast of the TV Classic Dark Shadows, and it’s currently available on Kindle for only three American dollars. It’s fantastic, and if you’re interested in the making of Dark Shadows, then you need to own it. 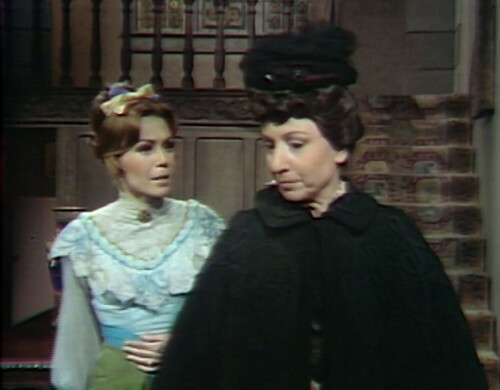 Minerva is definitely channeling Miss Gulch – the only thing missing is the bicycle. Because she would never ride it into the house. Agreed about Rachel finally developing that wonderful, feisty, and somewhat more powerful personality…..so as to be significantly different from dumb, dreamy, Pollyanna Josette. Her fights are excellent, like with Don Briscoe and Roger Davis. Rachel and Tim were Bonnie and Clyde, just ask Mrs Trash, I mean Trask. I can imagine KLS going to Dan and asking for more character meat. Well, that was his subtext. The phrase didn’t exist yet. Then, later, they gave it to Kitty Soames, and it was good. This is the period when I fell in love with New KLS. Love Lady Kitty, she does one of the coolest things ever. Meow. Thanks for the Laura backstory. B & Co is eternally in my Amazon cart. Danny, I purchased Barnabas and Company a few months back, based solely on your recommendation, and it is indeed fantastic. Hooray! I will eventually talk everyone into reading it. Just bought it today! $3.03. Still a great price. Thanks Danny! I had forgotten how central Rachel was in early 1897. The story of what really happened the night Simon Briar died is one of segments in The Crimson Pearl audio drama, which celebrated forty five years of Dark Shadows.